Spiced rum adds a festive flair to this holiday specialty coffee, perfect for an after-dinner entertaining choice. 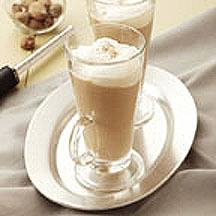 Top each mug with whipped cream and a sprinkle of nutmeg for an eye appealing attraction. Divide coffee, Coffee-mate and rum between two mugs. Top each with whipped cream and sprinkle of nutmeg. *NESTLÉ COFFEE-MATE Holiday Flavors are available late September through early January each year.